I took a few pictures of the garden room this week. The red truck filled with hearts ended up back in here. I pulled some red pillows down for the loveseat. 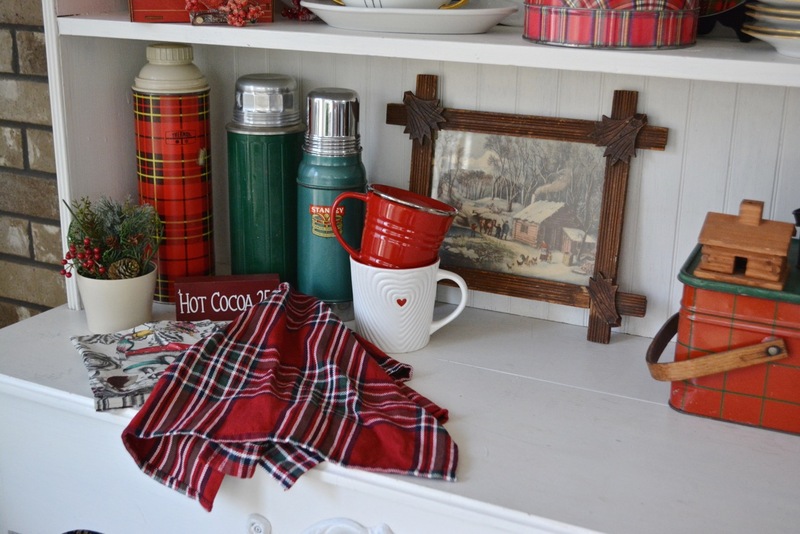 I like the washstand in here. It used to be in the living room. I showed you the end table I made over last week. The plants are in here so they are protected from the weather. 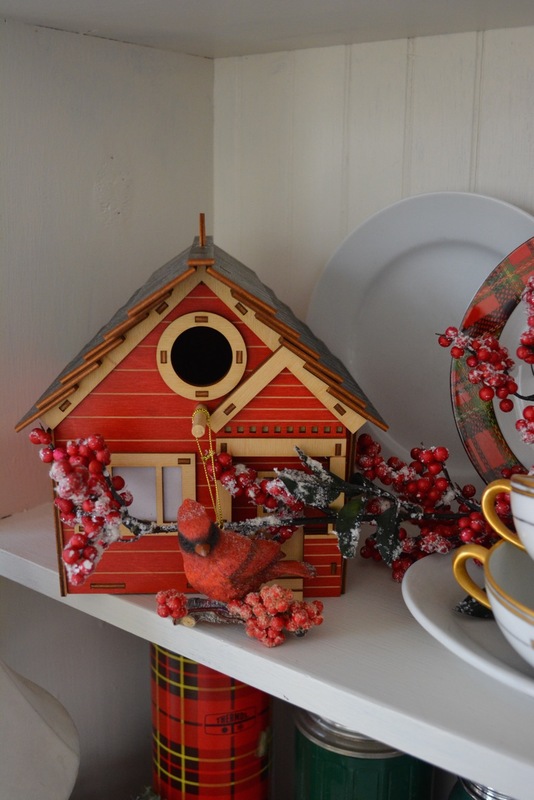 My son got me this darling bird house for Christmas. I don't want to put it outside because it is a work of art. The frosted branched and the cardinal are perfect for the nippy weather we have been having. The plaid is about to be packed away. A heart stands in for the Christmas ornament that was here. I about to switch this up for something a little more spring like. 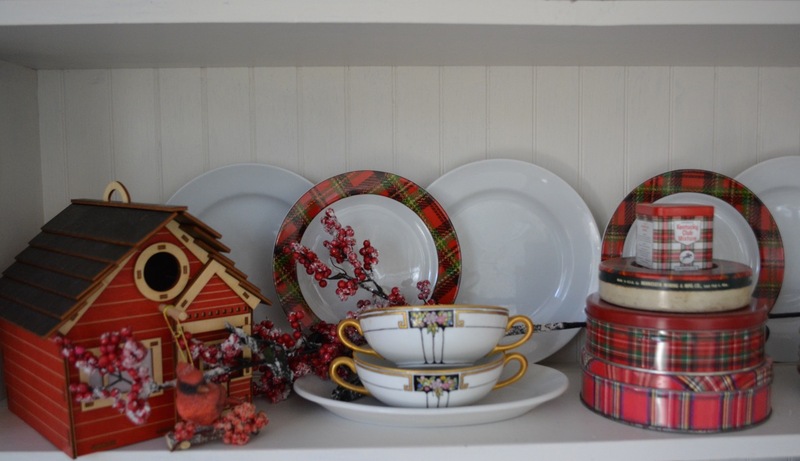 This is the last look at the winter dish dresser. The Hot Cocoa sign came from the Dollar Spot at Target. The Chevy Belair reminds me of the station wagon we had when I was a kid. 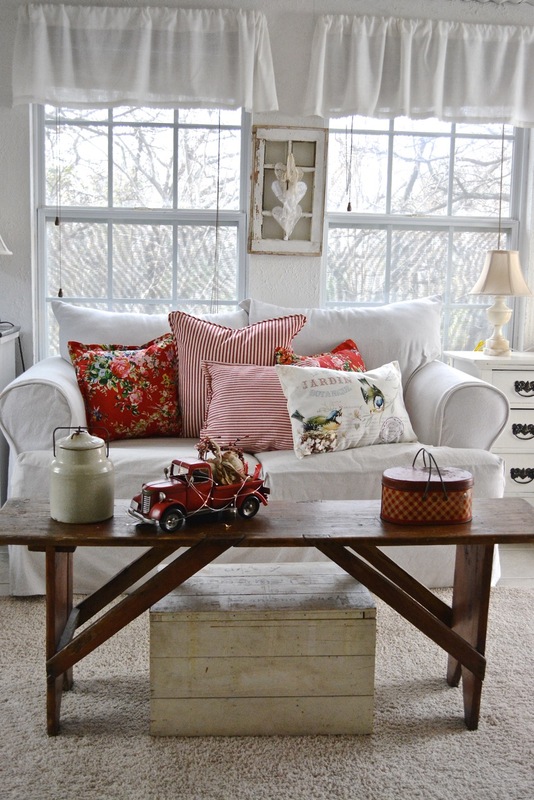 The cushions really add a lovely pop of colour for the season. 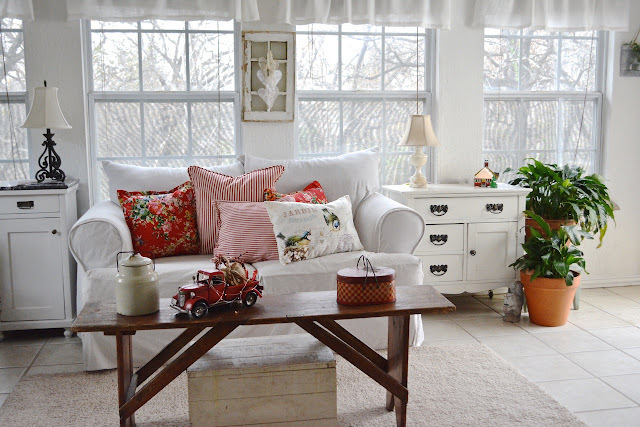 Being a lover of color, especially red, I LOVE all the pretty red touches that you have in this beautiful room!! 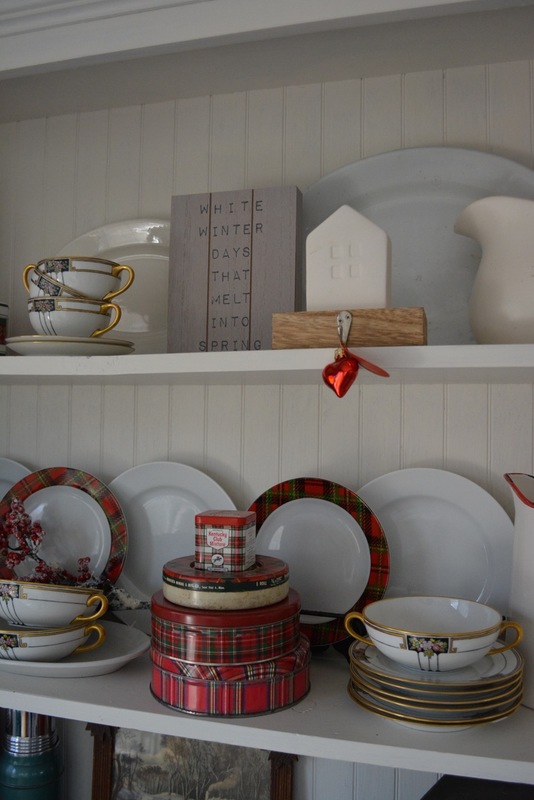 I especially love how you styled the dish dresser!! 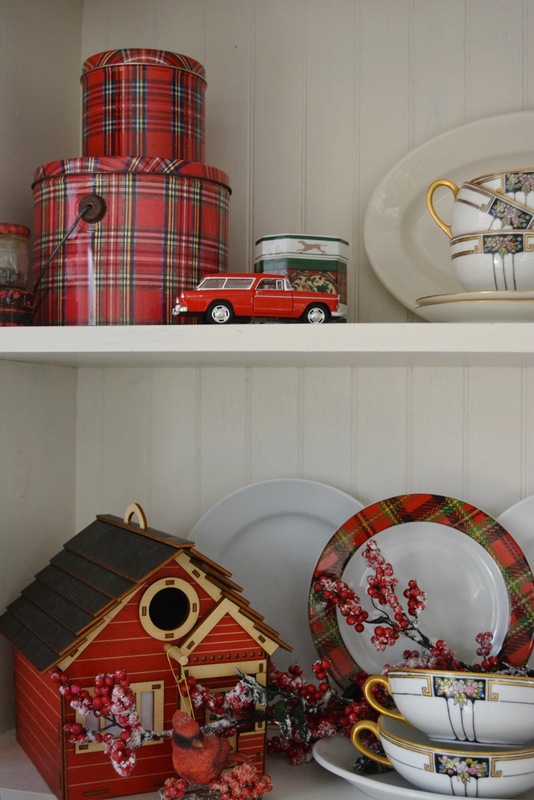 I adore that plaid!! Red is my favorite color, Katie, and I'm loving the pillows and other accessories you have sprinkled around your garden room. Great job! Hello! It was a very comfortable space. Loved the red pillows. The house your son gave you is beautiful. Have a good week. Love your Garden Room with all its natural light! 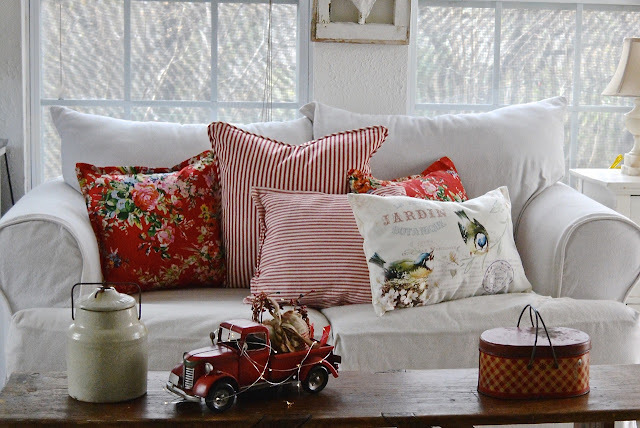 Those red ticking stripe pillows are quite stunning on the white slipcovers. 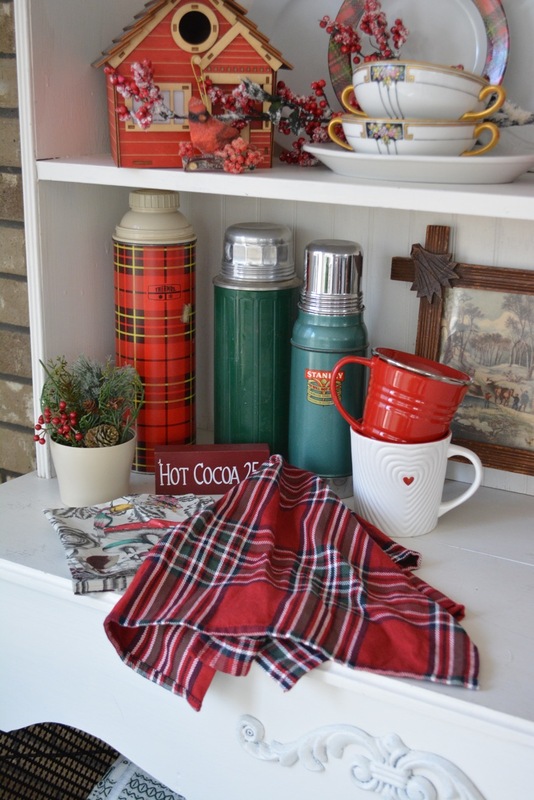 Adore all the vintage plaid boxes, thermos and accessories within your cabinet. 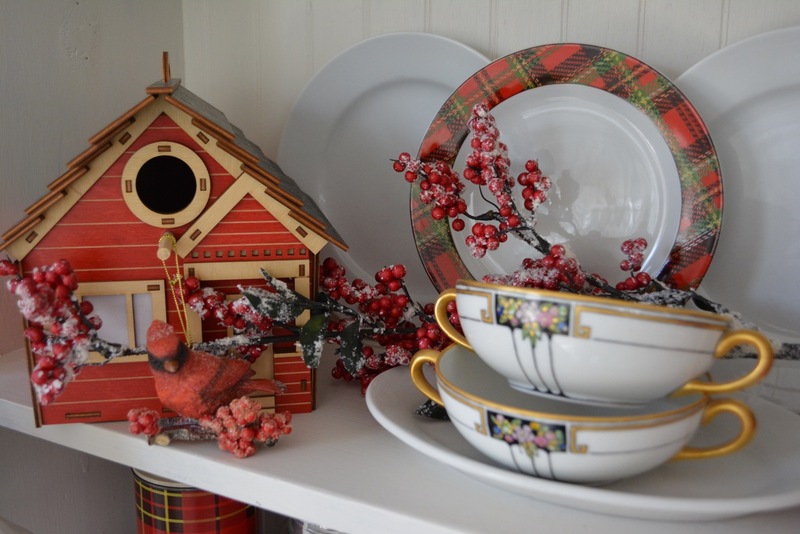 Like you, I'm making the switch over to some 'green' decor and accessories! What a lovely room. With moving and the ongoing renovation, I can't find my Valentine decor. Oh well, it will all come together sooner or later. A good use of the red pickup truck. It's enchanting, Katie! 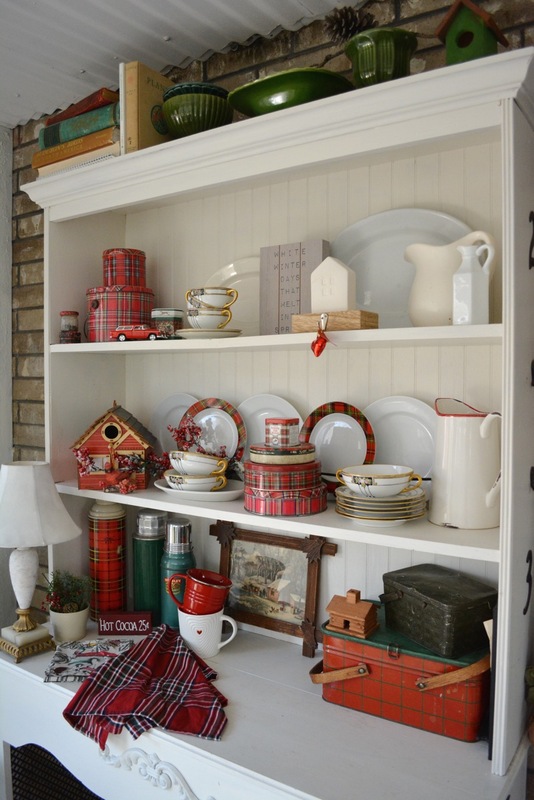 Red and white are always so fresh -- and very Valentiny too! A casinha de passarinho é linda! I love your red in the garden room. 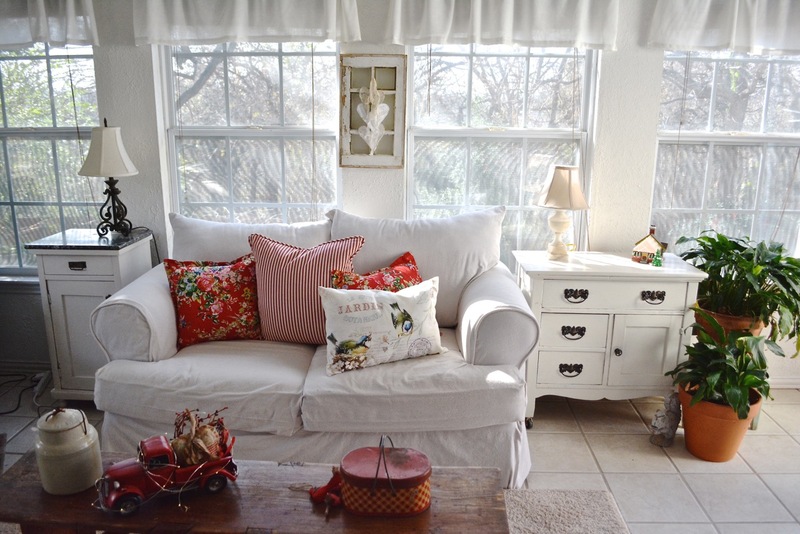 The red on your white sofa is gorgeous. 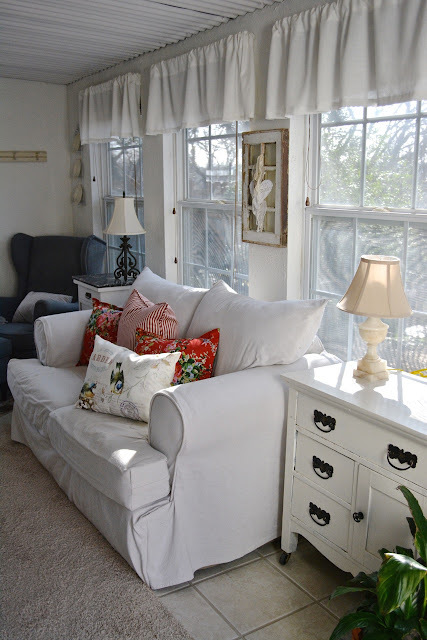 I love it all but I really love that old chippy small window with the lace hearts in between the windows. So pretty and chippy and sweet. Love the pops of color! I love white, but with the gloomy days, I'm so ready for some color! Great job. Lovely and so comfortable looking. 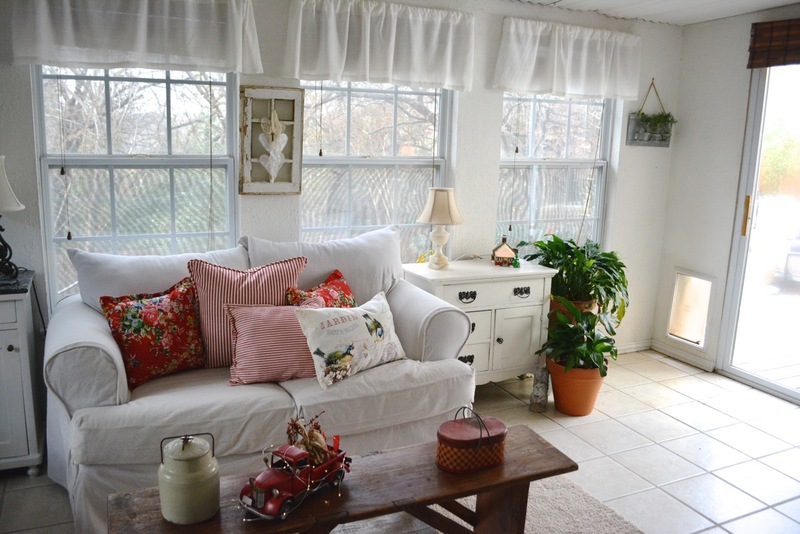 I would love a garden room as our living room does not get a lot of light. The red in there is just perfect. I love this room, Katie. 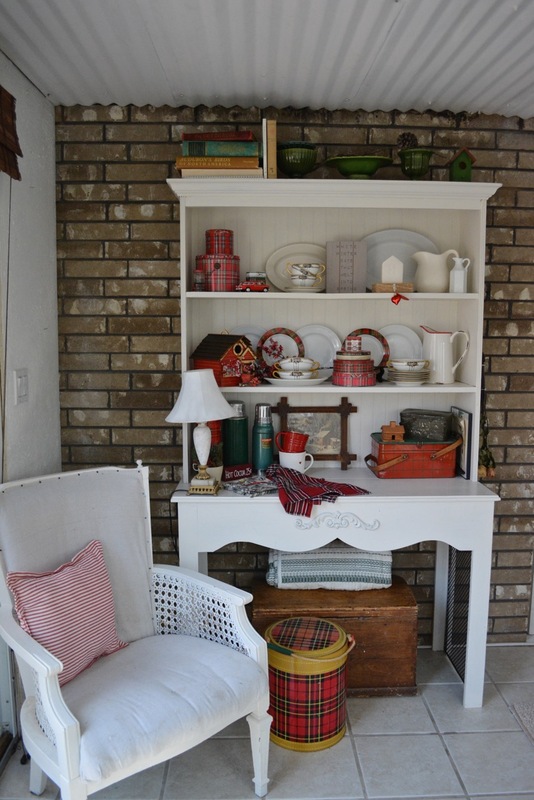 The pops of red really warm up all the white. 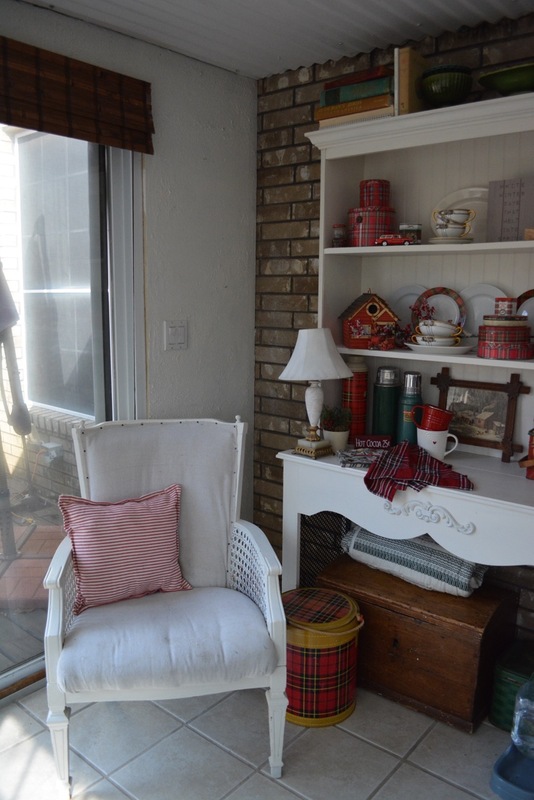 Seeing your space gives me hope for my new sunroom. But I love the term "Garden Room" since even though mine has a lot of windows it's not really "sunny" right now. I'd hang on to the plaid for as long as I could. I really missed my Tartan plaids this year. What a happy room! The pops of red are glorious, just love it all. Your garden room is truly unique and wonderful! 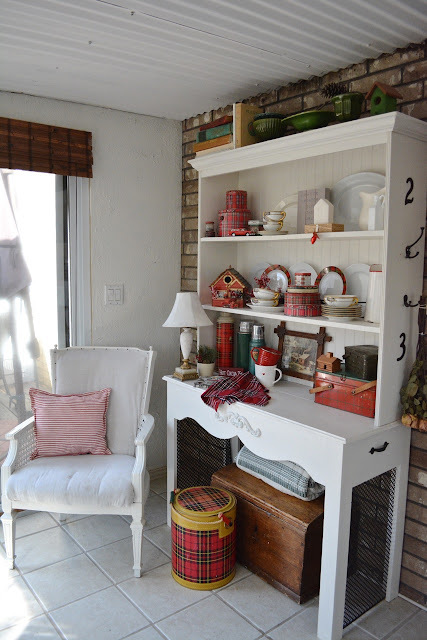 I love red --- your red touches in the garden room are wonderful! Your room looks beautiful! Love it!